All the practical information you need to know about the Glenbrook area. Turn left onto Burfitt Parade, which becomes Bruce Road and leads to the national park entrance. Park gates are closed and locked at night. The road crossing at the causeway may be closed after rain, so check park closure alerts on this website. Vehicle length restrictions exist for buses travelling over the causeway at Glenbrook and Murphys Glen. Restrictions are 7m for a fixed length bus or 10m combined length. For example, a bus with a trailer. Trains run from Sydney Central Station to Glenbrook Station. It’s a 1.5km walk from the station to the park entrance. Visit Transport for NSW to plan your trip. The Glenbrook area offers plenty of things to do and see all year round. Enjoy a gentle stroll or get your heart pumping on a hike, trail run or mountain bike ride. May is prime time to see flocks of migrating red wattlebirds, honeyeaters and noisy friarbirds around Tunnel View lookout. After rain, you might also see colourful fungi around damp creek beds. As the weather warms, wildflowers bloom attracting birds (and photographers). Nepean lookout is a bird watcher’s paradise where you can spot silvereyes, thornbills, pardalotes, or peep-wrens. Across the heath and in the woodland you'll see pink boronias, white flannel flowers, waratahs, grass trees and the creamy spikes of woody pears. Orchids are at their best in October. If you’re lucky, you might see a purple fringe lilly which flowers only for a day. Escape the city for a relaxing picnic. If it’s safe, swim or lilo Glenbrook area’s serene natural pools. You might see azure kingfishers and peregrine falcons around Jellybean Pool. Clear your head on a bushwalk. Nepean River walking track heads through a narrow, shady canyon, where the sheer walls create a rainforest hothouse for ferns, towering lilli pilli and coachwood. Winter doesn’t have to mean staying in. Enjoy cool climate camping at Euroka or Murphys Glen campground. There are plenty of brisk walks and mountain bike trails nearby to warm you up, or sign up for a professional run or ride along Woodford-Oaks trail. After an active day, cook up a feast around the campfire as the night sky fills with stars. Keep an eye out for the local nightlife at Murphys Glen — you might spot possums, sugar gliders and bats. All Blue Mountains National Park visitors planning a long hike, off-track or overnight adventure, or visiting a remote part of the park, are recommended to fill in the trip intention form and carry a Personal Locator Beacon (PLB). Find out more about hiring a PLB and completing a trip intention form on the dedicated iPads at Blue Mountains Heritage Centre (Blackheath), Katoomba Police Station, and Springwood Police Station. Keep well back from cliff edges and waterfalls at all times, especially when taking photos. Read our waterfall safety tips. Please stay on tracks and be aware of your surroundings and footing. Hundreds of cyclists head to our national parks for fun and adventure. If you're riding your bike through a national park, read these cycling safety tips. Avoid jumping or diving into natural pools. Beware of submerged objects and changing conditions underwater. Bacteria levels in natural pools can be high after rainfall (and at other times) due to run off from surrounding urban areas. It’s best not to go swimming until several days after rain. Campfires are permitted only in the fire pits provided. Solid fuel burners and campfires may be prohibited during high fire season. Recreational hunting in NSW National Parks is an illegal activity and is a fineable offence. Summer is an ideal time to visit Penrith - one of Sydney's best inland aquatic playgrounds. Have fun riding the rapids at Penrith Whitewater Stadium,, visit Sydney International Regatta Centre, paddle on Nepean Gorge in a canoe or relax with a picnic by the Nepean River. 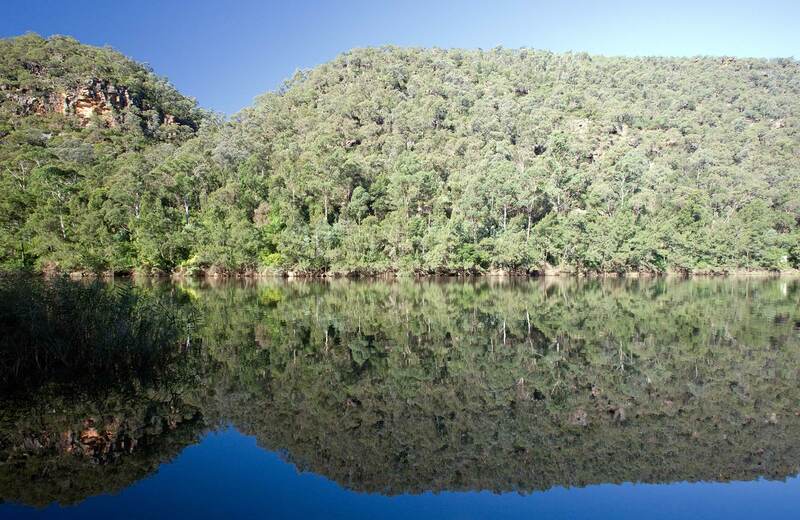 The Sassafras Gully Loop is one of a number of excellent walks in Springwood. The trail takes you from Springwood Station and past wonderful rock features, dense bushland and waterfalls. It's a nice cool walk in the shade and you're never too far from water.